Here is the Christmas story I told with my sketch-board at a "Carols among the Gum-trees" in December 2016. The story begins in the Judean hills near Bethlehem. Some shepherds were sitting at night watching their flocks of sheep. They were not modern shepherds, with quad-bikes and sheepdogs, just poor men who guided the sheep to good grass in the daytime and guarded them at night. It was a dirty, lonely and at times dangerous job, because there were wolves around. Nobody thought much about them, but they just got on with their job. This night, 2000 years ago, was different. Suddenly a bright light, brighter than the sun, shone around them, even though it was night-time. In the middle of the light was a mighty angel of God, looking straight at them. They were filled with ..... EXCITEMENT? "Wait till I get my camera!". "Wait till I tell the guys about this!". No! not excitement, but FEAR. The Bible tells us they were terrified. Why was this? To answer, we need to go right back to the beginning, when God made the world, all the animals, and the first man and woman. God used to come every day, in the form of a man, to talk with them in the garden of Eden. That was the happiest time of each happy day. But something happened. God had only given them one rule, to see if they would love and obey Him "just because" He had asked them to. But something went wrong. They thought they knew better than God, and believed a lie, that they could be like God by not obeying Him. When God come that day to walk and talk with them, they had FEAR for the first time, and tried to hide, but of course they could not hide from Him. He knows everything. Fear has been part of every life ever since. Every war says "Something is very wrong, and somebody will have to pay for it!". Every hurt, every hate, every fight says "Something is very wrong, and somebody will have to pay for it!". Every nasty name says "Something is very wrong, and somebody will have to pay for it!". Every lie, every stolen thing, says"Something is very wrong, and somebody will have to pay for it!". Every grave and every dying says "Something is very wrong, and somebody will have to pay for it!". All these WRONGS are what cause us fear, and the shepherds felt fear because they knew they had done their share of wrong things. 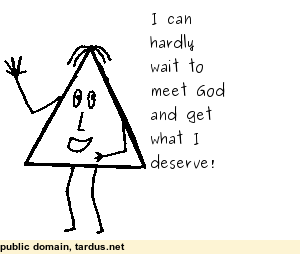 Only a very silly person would ever say "I can hardly wait to meet God and get what I deserve". A wise person would never say that! This would be an awful Christmas story if it ended here. Thank God, the story does not end here. One word that the angel said to the shepherds tells us this - NOT!. He said to them "Fear not! ", don't be scared. Why did he say this? Because God had sent him with a good message - "Today, in Bethlehem, a RESCUER has been born. God's Son Jesus, whose name means 'God Rescues'." Some we use the word "Saviour", but since that is not a word so commonly used now, except perhaps of the life-savers at the beach, I like to use the word "Rescuer". How could this baby, born to poor parents, in a stable (and not as a prince in a palace) rescue us? Because he did not stay a baby, but grew to be a man, and being God's perfect Son, died in our place, so that we can be forgiven, changed, and happy in God's company forever. Thank God that Jesus came "to pay for it!" If we hear the angel's "Fear Not!" and hug this good news from God to ourselves, then we will truly have a "fear not" Christmas, and a "fear not" new year, and forever. This Christmas, let every carol, every present, every happy time, remind you of God's greatest ever gift to us, that first Christmas.